Rituals around the certainty of death and the care of the dead are universal. All Souls’ Day in European folklore is related to customs of veneration for one’s ancestors which is practiced worldwide, through events such as the Roman custom of the Lemuria, the Celtic Samhain, the Chinese Ghost Festival, the Japanese Bon Festival, or the Mexican Day of the Dead. The earliest known references to All Saints’ Day are from the 4th century. In our time, celebrations of All Saints’ Day tend to focus on the lively connections among all God’s faithful servants in all times and places, the living and the dead, the revered and the forgotten. We are the communion of saints, we are the Body of Christ! 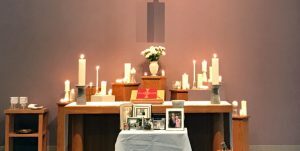 You are invited to bring photos or mementos of your departed for a “table of remembrances” that will be assembled in the church. Arrive early to place your items before worship begins, or bring your mementos to the church office prior to Sunday, November 4 and we’ll place them for you.